Artichoke Pesto & Spaghetti – Dig Delve – An online magazine about gardens, landscape, growing & making. Artichokes are one of the pre-eminent Italian ingredients and so it makes sense to look to Italy for ways in which to prepare them. This recipe is from the River Café Cook Book Green which, alongside Jane Grigson’s Vegetable Book, is the cook book I turn to most frequently when looking for inspiration for good simple vegetable recipes. Recipes for artichoke are legion, but they usually follow one of a number of tried and tested treatments; boiled and eaten with vinaigrette or another sauce such as bagna cauda, braised with herbs in stock or oil (sometimes with a stuffing), deep-fried, roasted or chargrilled or, more unusually, sliced very thinly and eaten raw as a salad vegetable. This recipe attracted my attention as the artichoke hearts are used raw to make a pesto-like sauce for pasta. 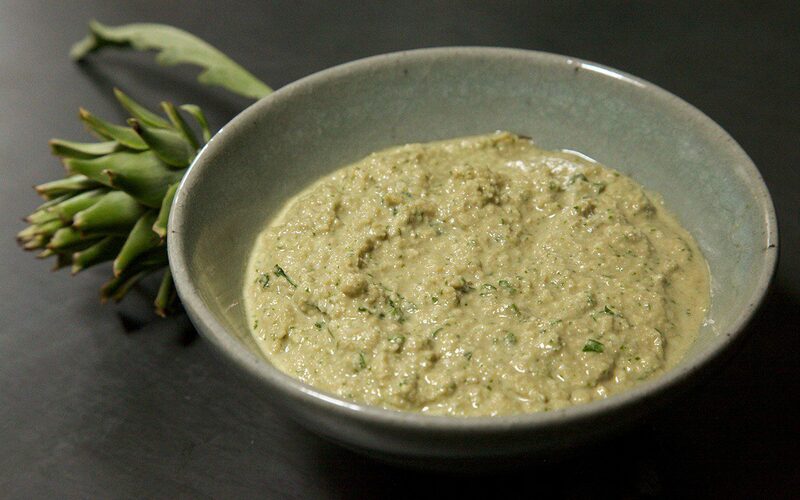 The pesto itself is a pale beige colour and so this is not necessarily the most photogenic of platefuls, but it is the delicate flavour of the artichokes that is so readily captured; their slightly resinous and nutty flavour foregrounded by this simple treatment. The sauce is deliciously creamy and rich, yet it has a completely vegetal freshness. I have halved the number of garlic cloves called for in the original recipe as, to my taste, they overwhelm the subtlety of the artichokes. At this time of the year I trim the stalks and bases from all the artichokes, even the smallest, as these parts become increasingly fibrous towards the end of the season. If you make this earlier in the season with young artichokes it is possible to use the first 5cm of the stalk too, once the fibrous outer layer has been peeled away. The pesto can also be used like a tapenade on bruschetta or crostini topped with some shaved Parmesan or Pecorino, or a slice of Parma or San Daniele ham. To use it in this way prepare as for the sauce below, but allow the pesto to cool after adding the butter. First prepare the artichokes. Squeeze one of the lemons and put the juice and the quartered lemon hull into a bowl containing enough cold water in which to submerge the prepared artichokes. Slice the second lemon in half and keep close by. Carefully pull the tough leaves away from the base of the artichokes, proceeding in concentric circles until you reach the softer cream leaves towards the heart. With a small, very sharp knife carefully remove the stalk and trim any dark green remnants of the leaves from the base. Immediately rub all cut surfaces with one of the lemon halves. Cut off the green and spiny tops of the leaves and discard. 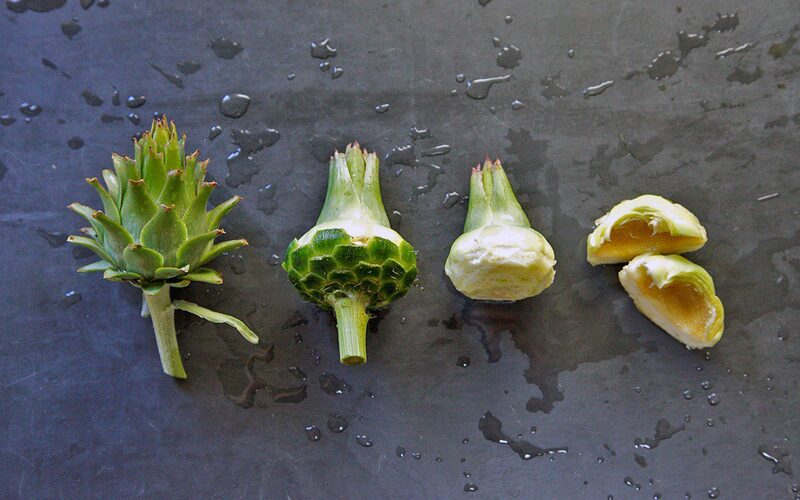 Cut each artichoke heart in half and remove the hairy choke in the centre with a small teaspoon. 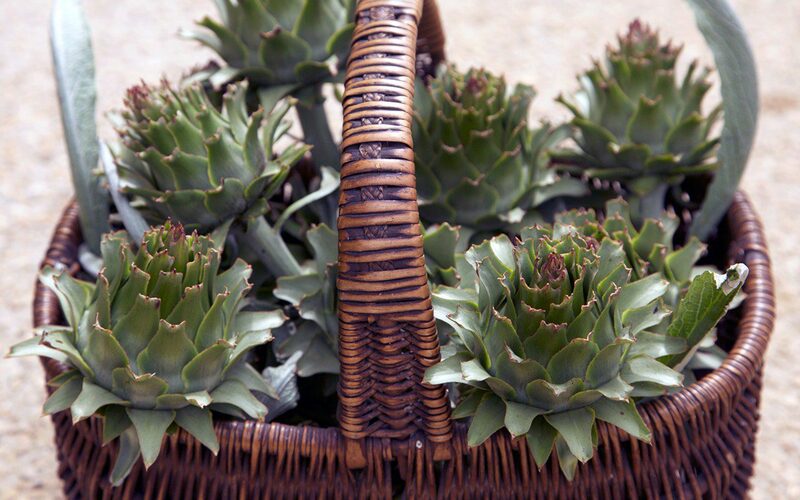 Rub all surfaces with one of the lemon halves again and put the artichokes into the acidulated water. Continue until they are all done. You should have around 200g of artichoke hearts. Drain and dry the artichoke hearts and put into a food processor with the garlic and pine kernels or almonds. Process quickly until coarsely chopped. Add the milk, parsley leaves and Parmesan and process quickly again. With the food processor running at a slow speed gradually add the olive oil. You should have a fairly wet cream, but it will thicken as it stands. Season with salt and put into a small saucepan. Cook the spaghetti in boiling salted water until al dente. Drain and return the spaghetti to the pan with a ladleful of the cooking water. While the pasta is cooking add the butter to the pesto and put over a low heat. Stir frequently until the butter has melted and is well incorporated and the sauce has heated through. Add the sauce to the pasta and stir well to coat. If it seems a little thick add some more of the pasta water until a coating consistency is achieved. The sauce should be quite wet. Serve with freshly grated Parmesan and a sprinkling of coarsely chopped flat leaf parsley.